We are excited to offer this new ready-to-assemble (RTA) line of kitchen cabinets from International Kitchen Supply. Many customers ask for white, real wood cabinets that are affordable and ready to assemble. These new shaker style cabinets are the perfect answer! Plus, you don't have to sacrifice quality for affordability -- cabinets feature a full overlay solid hardwood door and drawer frame with an MDF center panel. IKS cabinets are ready for quick ship and have been pre-fitted for precise and consistent quality. 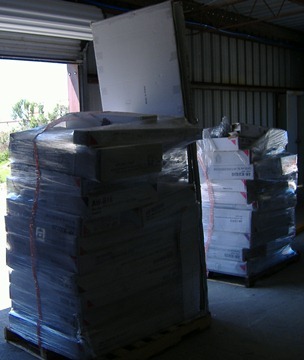 RTA cabinetry is affordable and less expensive to ship than assembled kitchen cabinets. An RTA kitchen averages 60 to 80 cubic feet for shipping purposes, while an assembled kitchen averages 225 to 275 cubic feet. If shipping from Florida to Bermuda, you could save over $1100 in shipping costs. To learn more contact us or download our free Kitchen Starter Guide.